Our Tamil to English Translator Dictionary with an enormous number of words provides you with an ideal opportunity of finding the definitions as well as adequate translations of any word you search. We afford you an opportunity of downloading this application without charge and using it without an internet access. We are profoundly sure that you will never find a substitute for this exceptional app. Discover the translation variants of English words and phrases, as well as finding word definitions. Study structural relationships in a foreign language and the grammatical functions of words by bringing example sentences with each word you are searching. Deepen your understanding of verb conjugations, spelling, pronunciation as well as word formations and the origins of words. Gain a comprehensive knowledge of technical translations in addition to slang terms, idiomatic forms and phrasal verbs. Find synonyms and antonyms of the dictionary entries by having numerous synonyms at your disposal. Save unlimited number of unknown words in a section called “Favorites”. 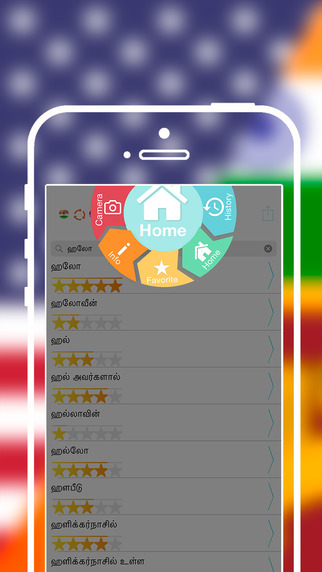 We insure you that the consumption of our Offline Tamil to English Translator Dictionary will be enjoyable in addition to being instructive for all our users. It is customized exactly for your Apple devices and is the best choice for your iPhone, iPad, iPod Touch. The following app is often updated and from time to time the number of words will vary. If you have any complaints or suggestions about our app you can contact us by our Facebook account. We look forward to hearing your new ideas and offers and we will definitely address your concerns as soon as possible. Give it a try and install it right now and you will notice studying foreign languages easy and enjoyable.